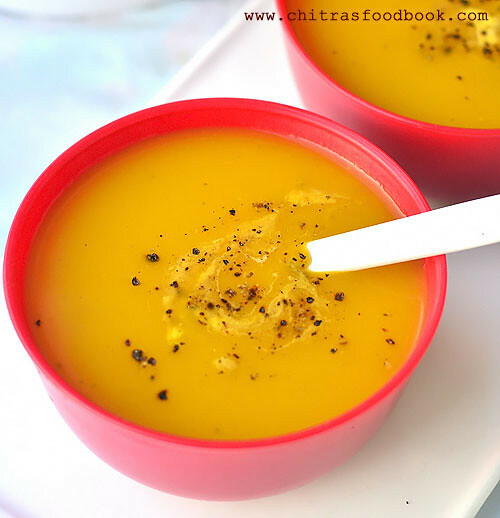 I tried this Indian style Pumpkin soup recipe ( manjal poosanikai soup in Tamil, Kaddu ka soup in Hindi) using Wonderchef soup maker. 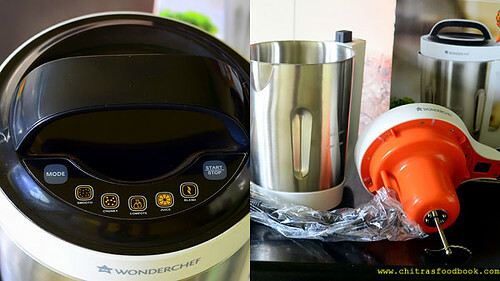 Recently I got Wonderchef Automatic Soup Maker to review the product. As wonderchef is a renowned brand, I agreed without any second thought. Wonderchef Kitchenware offers one of the best cookware and kitchenware appliances curated by our Chef Sanjeev Kapoor and Ravi Saxena. It offers a wide range of ultra stylish cook ’n’ serve casseroles, designer non-stick pans with health-friendly 5 layer coating, cold press juicers and super tandoors, mixers and much more for a modern kitchen. When I received their recently launched soup maker for the review, I was very happy to see the product and packaging. It was so good and easy to use with 5 different modes for making smooth soup, chunky soup, making compote, juice and blend mode. This evening I tried making pumpkin soup in the automatic soup maker. I loved the smoothy, creamy end result. 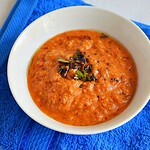 All it takes is just 20 minutes to cook, blend and make a delicious soup. This automatic soup maker does the job of a pressure cooker and mixie. Yes it cooks the vegetables to smooth or chunky pieces as per the selection of the mode and grinds well to make it creamy and thick. Ok, lets see about this product in detail below. As pumpkin tastes bland, I used bayleaf, onion and garlic sauteed in butter to lend some flavor. We liked it very much. 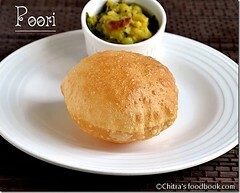 So this is purely an Indian style recipe without using fresh cream. 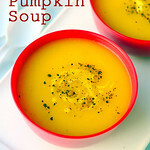 Hope you will like this easy pumpkin soup recipe. 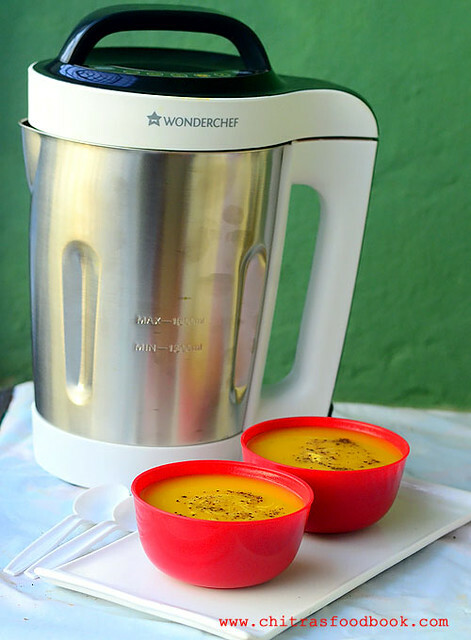 About Wonderchef Automatic Soup Maker – Specifications and Features. It resembles a bigger sized kettle with a minimum and maximum capacity of 1.3 to 1.6 liters. It has a stainless steel body and a not so sharp blades for blending the soup. It just occupies the space of an Indian mixer as its size is not so big. It has 5 different operating modes with touch control and programme indicator lights. It can make smooth soup, chunky soup, compotes for babies, juices/smoothie/ milkshakes and blends without heating. 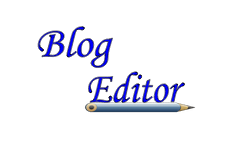 One can select the mode as per the need. Each mode is built in with Intelligent control systems with timer options to prevent dry burning. This product comes with a 2 year warranty from the date of purchase. Tech Specs: 220V~50Hz Motor: 140W, Heater: 800W, Copper motor. It comes with a clear instruction/operation manual with all the do’s & don’ts. The look of this product is good. It looks modern and not so big for this capacity. 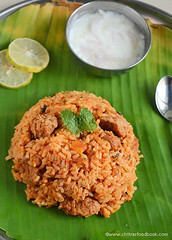 It does the job of a pressure cooker and blender which is very much comfortable. This product gives a beep sound once the process is over. So you can relax. You can easily make the soup or juice for a family of 4 to 5. Operating time is lesser for this quantity. It has a hassle free operation. There is no need to strain the soup. 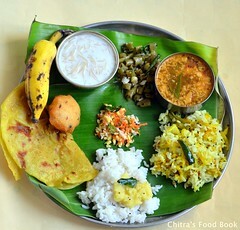 So the fiber is retained in the dish. 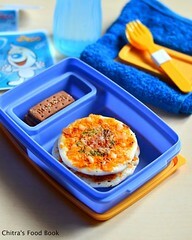 It has an option to make compote for babies without touching the food. We can make homemade soup with our own combinations. 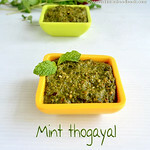 You can make it more healthy without any preservatives unlike store bought readymade soup packets ! The first thing that strike my mind is the quantity/capacity of this product. We should make minimum 1.3 liters of soup which I felt too much for a 3 member family like us. It would be ideal for 6 to 10 people. For us, it comes to 2 servings each. I felt it would be better If Wonderchef can bring a smaller size in this product. There is no reheat or warm mode in this product. There is no indicator/led light to show the machine is ON. We should identify its under operation only with the sound. 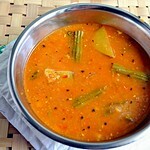 There is no Saute option.So if a soup recipe calls for sauting the spices and vegetables, we should do it separately in a kadai and transfer to the soup maker. Costwise it is slightly lesser than Philips and Morphy richards. For more details and to buy this product, visit Wonderchef Automatic Soup Maker. They also have a facebook page WonderchefLife. 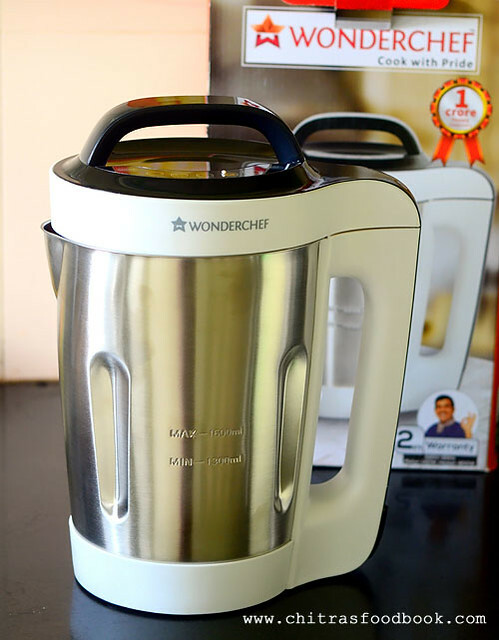 Wonderchef products are available on Flipkart and Amazon as well. DISCLOSURE : I have reviewed this product after using it on my own. All the points shared here are my own views. Lets see how I prepared Indian style pumpkin soup using this soup maker in detail. Wash and peel the skin of pumpkin. Chop into small pieces and set aside. In a kadai, heat butter and saute bayleaf, onion and garlic cloves. Add pumpkin pieces to it. Saute well till raw smell goes off. 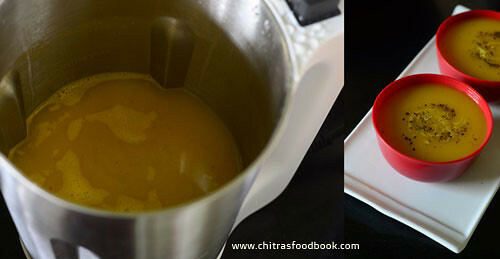 Add water, salt and transfer to the Wonderchef Automatic soup maker.Cover with a lid. Switch on the machine. Press mode button and select Smooth soup option. It beeps and starts processing. It gets switched off after 20 minutes with a beep. Open carefully and transfer to a bowl. Add pepper powder, fresh cream and serve hot ! Read the instruction manual before you start with. Wash and slice the skin of pumpkin.Discard it. Now chop the pumpkin into small pieces. Chop onion and garlic cloves finely. 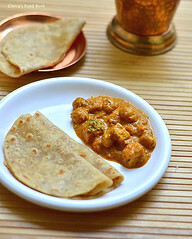 Heat butter in a kadai. Saute bayleaf. Add onion and garlic cloves. Saute till transparent. Add Pumpkin pieces and saute till its raw smell goes off. Saute for 5 minutes. Now add water, salt and transfer everything to the Wonderchef Automatic soup maker. If you don’t have the soup maker, you can make everything in the base of pressure cooker and cook it for 2 whistles in low flame, grind to a smooth paste, add pepper powder and serve hot ! For soup maker : After you transfer the pumpkin to the soup maker, cover with the lid.Switch on and press the MODE button. When you press repeatedly, you can see the selection of different options. Press till SMOOTH button flashes. If you like chunky soup, you can select CHUNKY option. Press START BUTTON. Process starts and finishes automatically. Steam releases from the mouth of the jug. You can just sit and relax till it beeps. While it blends the soup, you will hear the sound of a mixie. Do not panic like me , hehe. Approx. it took 20 minutes for the process to complete. After the process gets over, you will hear a BEEP sound. Open the lid carefully because steam comes out vigorously. Do not show your face while opening the lid.Transfer the soup to the bowl. 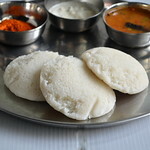 Add pepper powder, fresh cream if you like. Serve hot with any bread, grilled veg sandwich ! 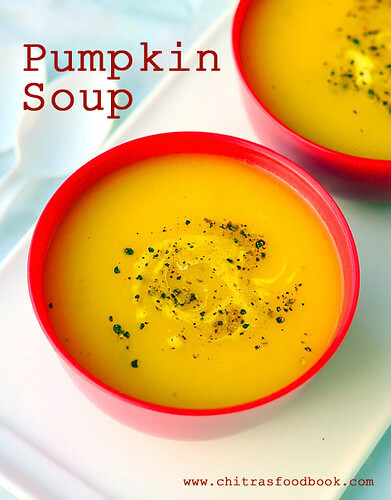 Enjoy this easy, healthy, creamy pumpkin soup during this winter !